Paul Hoffman's novel of astonishing scope and imagination, featuring a darkly gifted teenage boy at the center of a brutal holy war, grabs the reader from its incredible opening lines and refuses to let go. 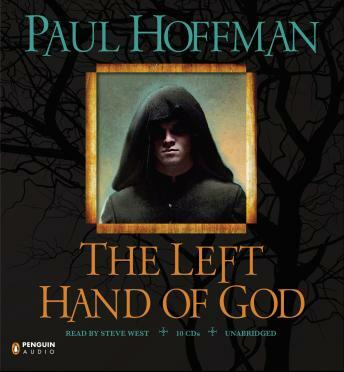 The Left Hand of God is the first novel in an epic, ambitious trilogy that will prove irresistible to the readers who have turned the Inheritance Cycle, Twilight, and the His Dark Materials series into publishing phenomena. The Left Hand of God is the story of sixteen-year-old Thomas Cale, who has grown up imprisoned at the Sanctuary of the Redeemers, a fortress run by a secretive sect of warrior monks in a distant, dystopian past. He is one of thousands of boys who train all day in hand-to-hand combat, in preparation for a holy war that only the High Priests know is now imminent. He has no reason to think he's special, no idea there's another world outside the compound's walls, and no hope for a life any different from the one he already knows. And then, Cale opens a door. What follows is a daring escape, an unlikely alliance, a desperate pursuit, a journey of incredible discovery, and an adventure the likes of which Cale could never possibly have imagined, culminating in Cale's astonishing realization that he alone has the power to save his world- or to destroy it.